The cavernous gorge at Parfreys Glen has been cut by a gentle babbling brook which day by day continues to write the story of persistence into stratified layers of stone. A winding trail back into the gorge of less than 1 mile in length has been delighting visitors for generations, making Parfreys Glen a destination hike in the Baraboo Hills. 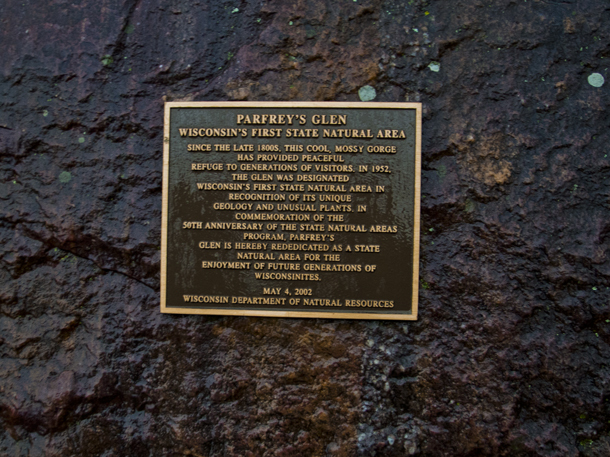 Parfreys Glen was Wisconsin's first designated state natural area, established in 1952. Since then the path into this natural wonder has been changed by frequent floods which have washed away robust boardwalk constructions and dismantled stone and concrete overlooks. Today, only the first half of the trail is maintained. 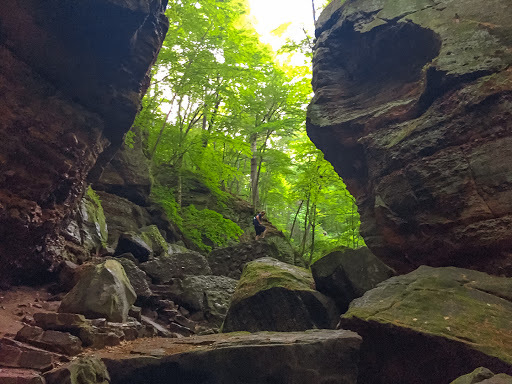 On reaching the mouth of the stone gorge the trail abruptly ends. 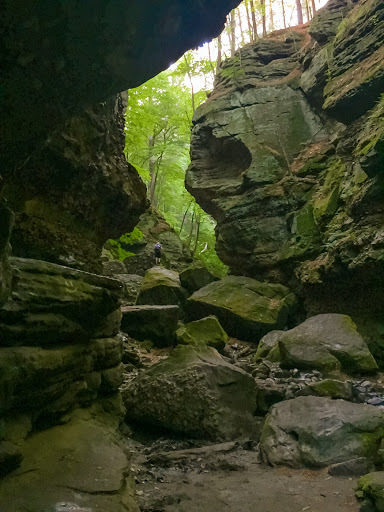 Those seeking to press on into the stone canyon must hike through the stream bed and scramble over giant boulders loosed from the canyon walls. 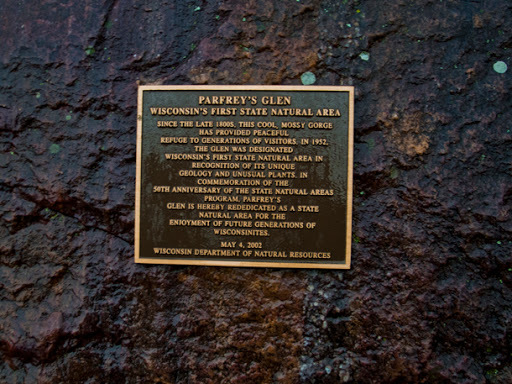 The trailhead for Parfreys glen is at a small parking lot off Sauk County highway DL just west of Devil's Head Resort and Ski Area in Merrimac. The lot can hold about 20 cars and is frequently overflowing with cars parked on the highway shoulder. There is a small picnic area, a vault toilet, and a water pump near the parking lot. This trailhead is also the trailhead for the Sauk Point Segment of the Ice Age National Trail. For those seeking a longer hike the Sauk Point Segment is a 4 mile walk from Parfrey's Glen to Devil's Lake State Park and includes a long two mile climb of 775 feet. 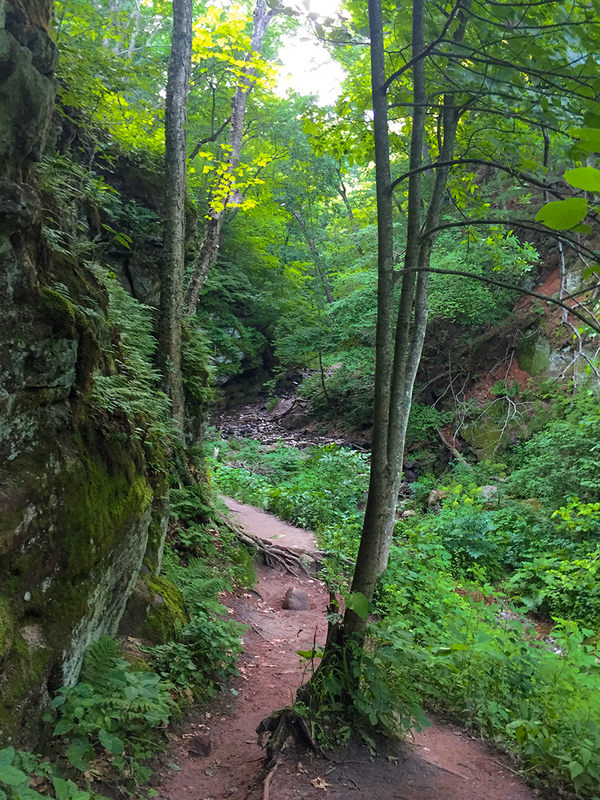 Most visitors to Parfrey's Glen prefer the leisurely stroll back towards the glen. 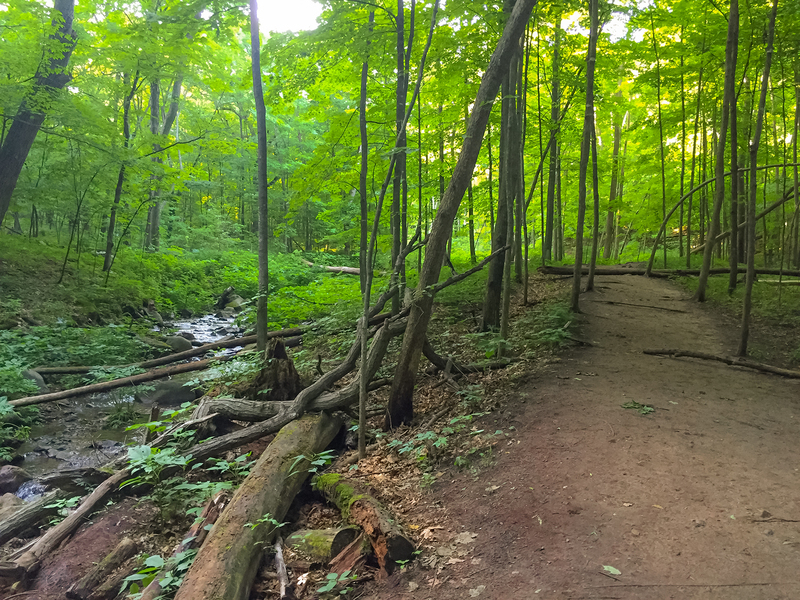 The trail begins on a wide gravel road before cutting into deep hardwood forest alongside the babbling Parfrey's Glen Stream. The trail is wide and easy. It crosses several constructed bridges as it winds back into the gorge. Further back there are a few easy rock hops over the stream to negotiate. As the sides of the ravine begin to rise the official trail ends. From the sign announcing the end of the trail curious and adventurous hikers must walk through the stream for a few hundred feet before catching up to some footpaths on the west side of the stream. 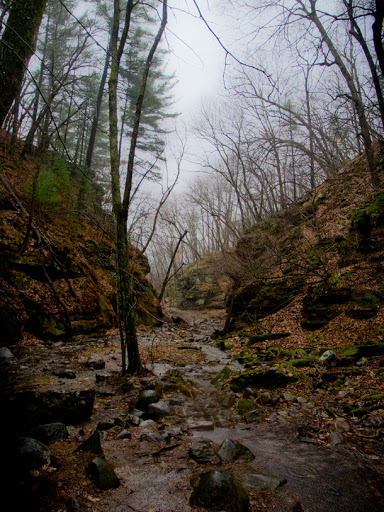 The stream bed is generally only ankle deep except after heavy rains when the water level can rise dramatically. 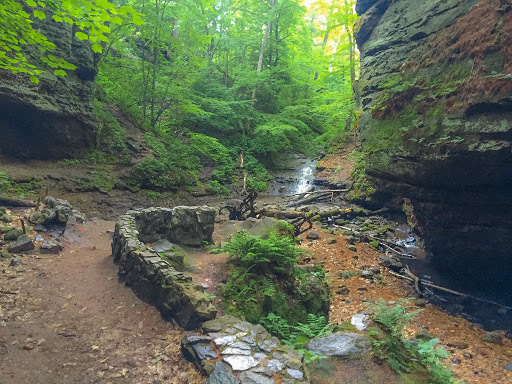 Further in the wooded ravine becomes more enclosed and transforms into a narrow stone canyon. Large boulders must be climbed up and over to continue on. You'll be able to see remnants of the old stone and concrete stairs of the former trail which have been broken apart by forceful floods. At the end of the gorge is a small waterfall. Today, with the boardwalk and stone pathway washed out most visitors to the glen will not make it all of the way to the waterfall. But, the gentle hike alongside the brook still draws many walkers of all ages and their families. The verdant ravine and photogenic stream seems a world away like a mysterious scene in fantasy film. Indeed Parfrey's Glen is a wonderful place. The protected ravine is home to rare species of flora and herbs which grow no where else on earth. Even if you cannot identify these plants there is a prehistoric feeling exuding from stone and earth gorge at Parfrey's Glen. 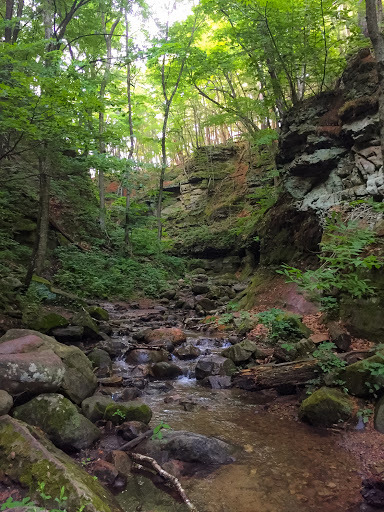 A directory of all hiking trails at Devil's Lake with brief trail summaries. 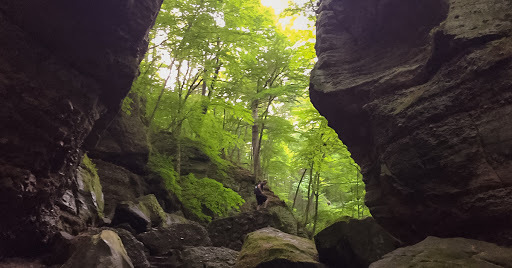 Pewit's Nest is an anomalous dark and damp gash in the Earth to be found by the curious in Baraboo Wisconsin. It is a favorite swimming hole - and by standards of Wisconsin's storied state parks and natural wonders - a well kept secret. You might find solitude here in certain seasons. But, on a warm summer afternoon expect lots of splashing and laughing. Don't forget your swimsuit and sandals. The views are good from above the gorge but better from the chilled pools that overflow and spill one into the next. It's not just one swimming hole; It's five. The views are good from Ferry Bluff. Ferry Bluff on Highway 60 between Sauk City and Spring Green is one of the finest perches for observing the Lower Wisconsin Riverway in all of it's splendor. It is a State Natural Area and features a high bald outcropping at a unique crook in The River. 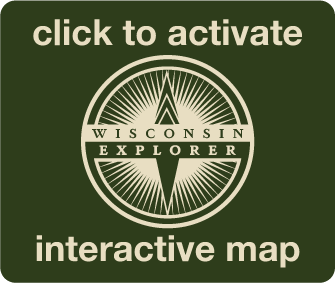 The Ice Age National Trail traverses approximately 1000 miles in Wisconsin. The overall trail is incomplete, with many miles of roadside walking between short segments of hiking trails. The Gibraltar Rock Segment is a 4.6 mile length stretching from the Merrimac ferry to the summit of Rocks of Gibraltar State Natural Area. The length of this segment includes approximately one mile of roadside walking alongside the relative quiet Columbia County Road V. There is ample shoulder space on the road to make this portion of the walk comfortable for avid hikers.